After 23 years of reporting from such far-flung spots as Rochester, San Francisco and Hong Kong, Amy Wu now covers politics and government at The Californian, a Gannett paper in Salinas, Calif. Wu, who earned her master’s degree in journalism from Columbia University, finds that while the media landscape has changed profoundly in the last two decades, new challenges lead to new rewards. This roundup of her tips for navigating a shrinking newsroom is the first of a five-part series. I love the smell of print and flipping versus swiping. I’ve waxed nostalgic at the Smith Corona an ex-boyfriend gave me. But as anyone under the age of 35 will tell you, unless your story is developed for digital consumption, you might as well not write it in the first place. You don’t need to go all-in digital overnight. Explore and add digital assets one project at a time. Maybe it’s thinking about how you could present a story as a photo gallery or a 45-second video instead of—or in addition to—a text article. With fast-shrinking attention spans, there’s a growing thirst for visual content. Business stories, in particular, are often starving for good visuals. If done right this these assets can make the information a lot more interesting, accessible and sharable. A changing media landscape means a shift in performance measurements too, and clickability–no eye rolling here—counts. This can be hard to embrace for those of us who started in the print world. A slew of new analytics software measures everything from where on a screen viewers first look to the point at which they stop. Get to know how it works. I have a program that emails me a daily report of the paper’s most popular stories and how my byline ranks. Checking your ranking can be addictive (a bit like the stock market), but it gets my competitive juices flowing. Remember the inverted pyramid? Now forget it. Or at least selectively toss it out. In the smartphone-centered universe, the pyramid doesn’t always hold water. Reporters need to write for a mobile audience. That includes a juicy headline incorporating key elements in your story, including geography. In my case, that means “Salinas City Council Says ‘No!’” or “Salinas Police Raid YMCA.” Follow it with a “tell all” paragraph that summarizes the most important points and you’re done. This can be tough, but the good news is you can collect the “yarn,” save it and perhaps use it for another story. Nothing is truly wasted. In the good old days you might saunter into your editor’s office and use her as a sounding board about how deep a story should go. Say sayonara to that. You are your best curator. In general, in a 24/7 news cycle it’s best to share just enough story to keep the readers’ attention, and have confidence that you are your readers’ best North Star. You are the one interviewing sources, sitting through the City Council meetings and talking to the community. Think like a chef: too little food and the customer complains about the anemic portion. Too much and the customer can’t finish. 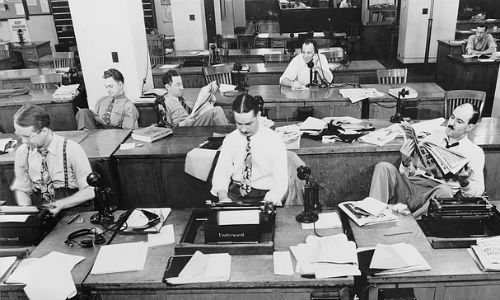 It’s not just newsroom staffs that have shrunk, it’s newsrooms themselves. Journalists need to equip themselves with the basis for reporting on the fly, whether it’s tweeting from a budget hearing or interviewing a source from your kitchen table. The critical checklist includes Skype, robust WiFi, a smartphone with ample storage, a battery charger, power cords and a fast and light laptop. Try to go paperless and email documents and store them in a portable hard drive.